If you have ever visited Luxe du Jour, you might have figured out that I LOVE to create fun, themed table settings. 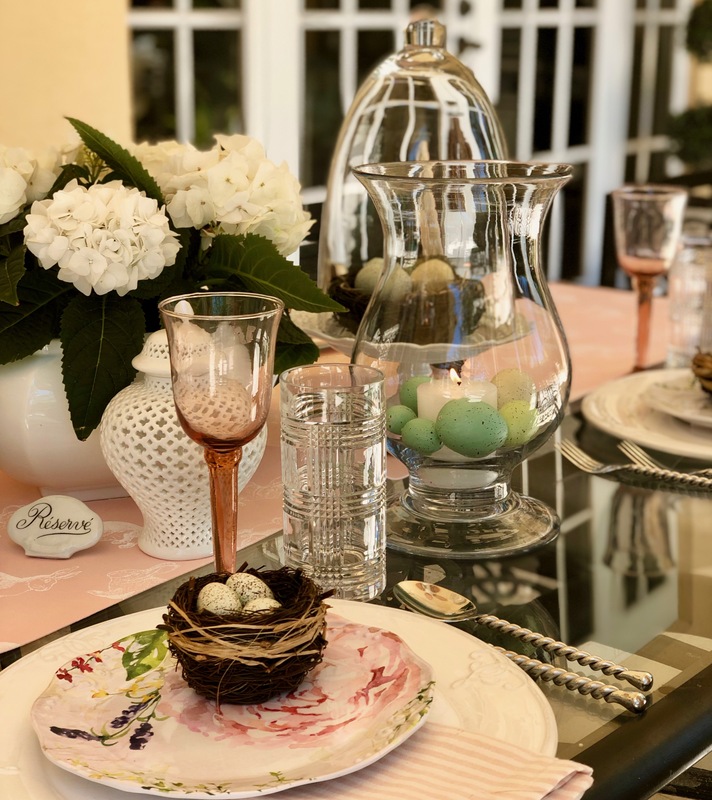 With Easter just around the corner, I decided to put together my table setting ahead of time to hopefully offer some inspiration. A Close Up Of The Table Setting – Love The Miniature Bird Nests! First, I gathered all of the items that I need on our kitchen island. Then, I set everything up outside on our patio table. Hopefully, the weather will remain a bit cooler, so we can enjoy being outside. I got the napkins, large plates, and soup tureen at Homegoods. The ceramic bunny is something I have had for many years, and is from Fitz & Floyd. The water glasses are from Ralph Lauren (love me some RL). 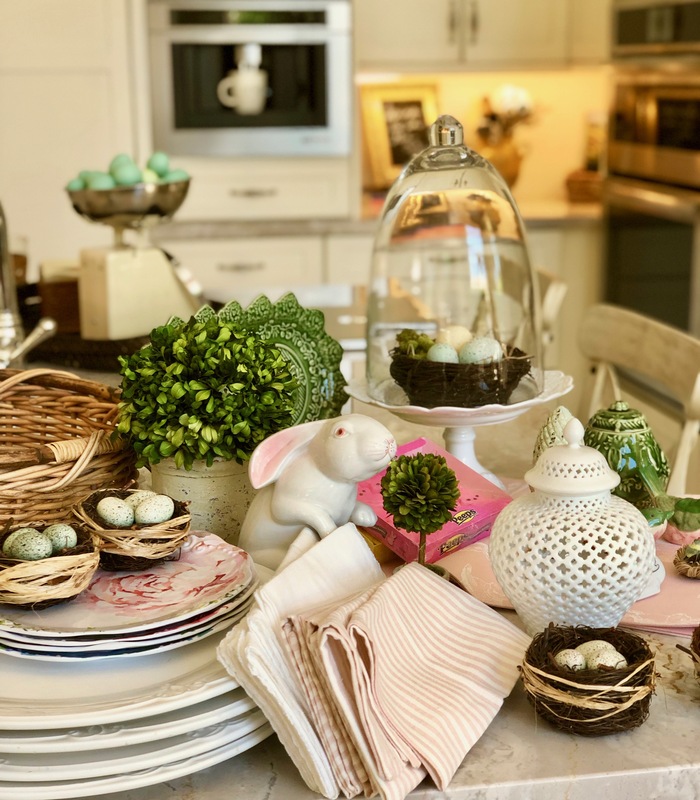 Those adorable mini bird nests are from Pottery Barn. They have so many beautiful items! Pier 1 had those beautiful floral accent plates. Actually, Pier 1 had so many fun Easter things, that I had to control myself from buying anything else. Our traditional menu includes a baked ham, gratin dauphinois (basically “cheesy” potatoes), fresh green beans, and a mandarin orange and toasted almond salad. All fresh, and delicious tastes! I serve a variety of flavored mustards to enjoy with the ham. I think this year we will have a nice Chardonnay with our meal. We just got a wonderful one from our wine club through Pride Mountain Vineyards In Napa Valley. Can’t wait to try it! Here is the recipe for the potatoes. They are really easy, and so delicious! The original recipe is from The Joy Of Cooking. I have added additional grated gruyere cheese on top to make it extra cheesy. Do you remember getting all dressed up on Easter to go to church? We always got new shoes, an outfit, and Easter hat. We usually went to our aunt’s house, and got to see all of our cousins. I don’t think that families do this anymore. Such a shame, as it made this feel like a special time, and while attending Sunday school, we learned the meaning of Easter.